The one book with all the data needed to fully repair, 100% mechanically rebuild and improve accuracy in Ruger Single Action Revolvers...and to keep them shooting forever!!! Click here for a sample page from the book. A 255 page gunsmithing encyclopedia and historical-technical reference on the Ruger SA Revolvers. Expanded, two-in-one, edition - 255 pages with plastic laminated soft cover. 600+ Crystal clear photos, ordnance style drawings, principle illustrations and graphics. 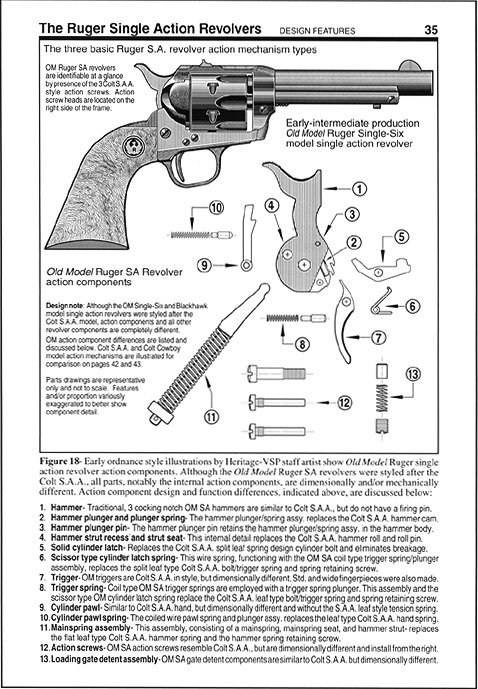 Ruger SA Revolver action function, cycle of operation, safety and safety features. Old Model, New Model and OM transfer bar conversion action parts identification. Complete disassembly, reassembly, parts replacement, repair and troubleshooting. Critical component inspection and special parts fitting to improve revolver function. Complete Old Model & New Model rebuilding, rebarreling and mechanical restoration. Action tuning, checking and adjusting action timing and accuracy improvement work. Large custom section includes custom components and cylinder, frame and sight work.